Today is National Blueberry Day! 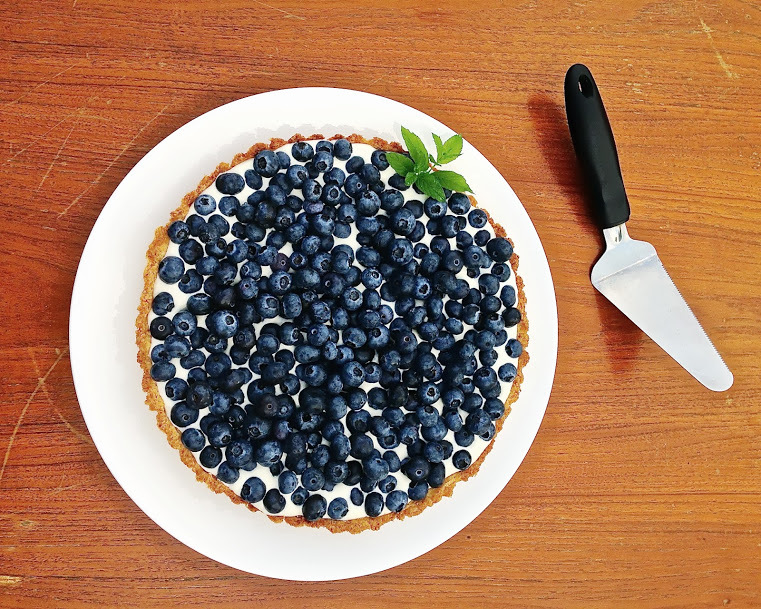 Here is a quick snap of a Blueberry Mascarpone Tart. I used the cheese filling recipe from Chef Dennis Littley’s “No Bake Peach Tart” with an almond crust and a pound of organic blueberries. Gotta snap up those berries when they are on sale! This entry was posted in Dessert, Food, Seasonal Recipes. Bookmark the permalink. I have to say, I rely on my aunt’s fresh fruit tart recipe when it comes to blueberries – but your post inspires me to think a little more creatively. Oooh, tell me more about your aunt’s fresh fruit tart? Do you have a link to it? This looks sooooo good. I have a no bake cheesecake recipe on the blog and I make a berry reduction to stop it off. I like this version even better cuz it’s one less step! LOL. Now I must try this. I love blueberries and they usually wind up in whole wheat pancakes or in my morning yogurt bowl.